Location data can be a safety net for teenagers while providing peace of mind to their parents or guardians. 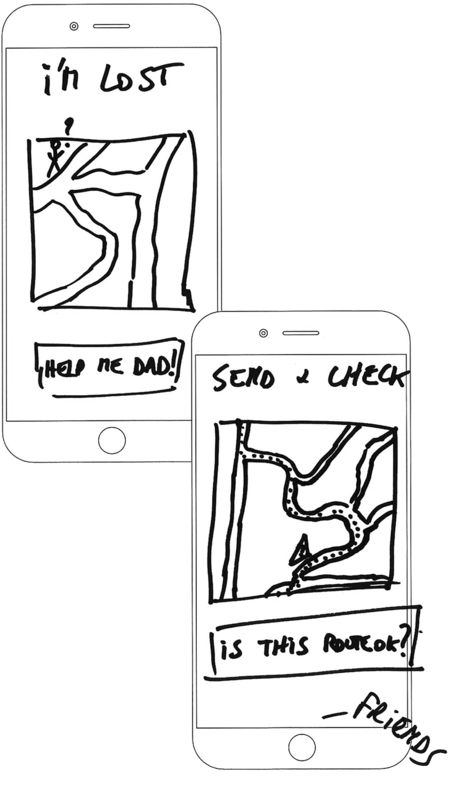 How can we design for transparency without intrusion to empower teens? 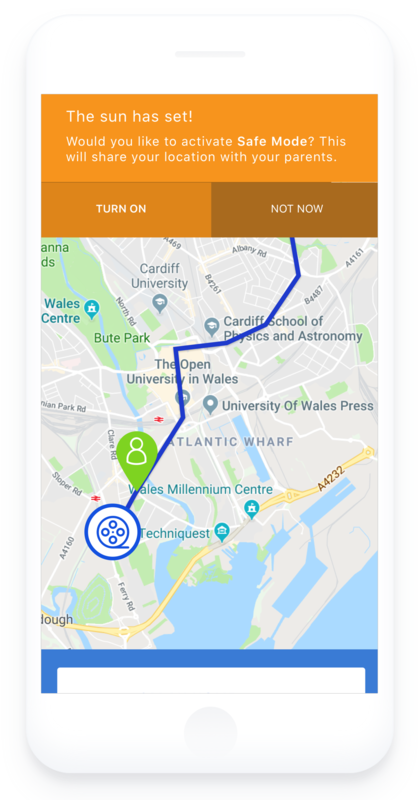 WayToGo is a fictional journey planner which uses live data on many transport methods – walking, cycling, bus, tube, rail, tram, ferry and taxi – to plan the best route to a destination. Young people have a good understanding of the safety concerns around location data, but they also understand that it's the context of how it's used that matters. They are willing to share their location data when they understand how it will be used and how it can benefit them. How can location data be used to empower young people when they go out on their own? WayToGo has a 'Safe Mode', which will share a teen's location and planned route in real-time. WayToGo notes that, 'The sun has set!' and recommends activating Safe Mode to share location with parents. The teen can choose to decline or explicitly turn it on. While on route, the top bar is used to remind the teen of current state, in this case 'Safe Mode On.' A notification is sent to recipients so they are made aware that the teen is explicitly sharing their location with them for safety reasons. 'Safe Mode' is a voluntary feature that the teen can switch on/off at any time. They have control over who to share their location and route with - not just parents, but friends as well. In order to ensure the teens knows the specific state of location sharing, which she is concerned about, the top bar of the interface is always used to display and control these settings. The top bar can be touched to reveal more controls in a drawer, giving them immediate access and control. Green Header - Sharing is turned 'ON' which means that a WayToGo route is being shared with a group or single person. Sharing can immediately be turned off by touching the green header to reveal a drawer and overall control. Additionally, the teen can just turn on/off individuals that she no longer wishes to share location data with. Grey Header - Sharing is 'OFF.' This state is important to give teens confidence that data is only shared with their explicit consent. 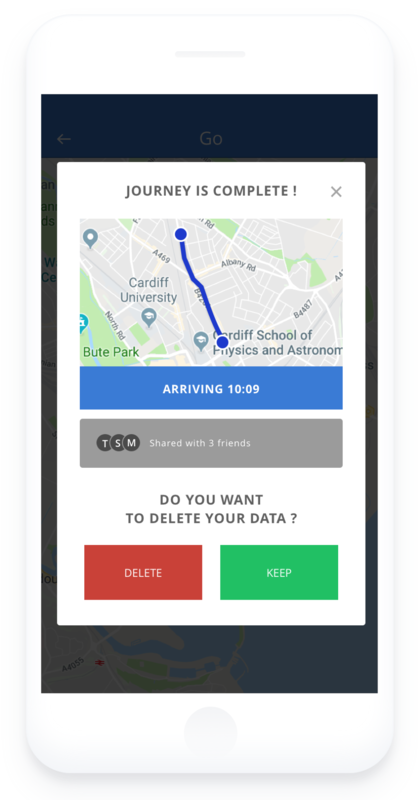 At the end of the journey, WayToGo gives the teen a journey summary and lets them know who they've shared it with while on 'Safe Mode'. Storage of data is not presumed, so there's an option to delete or keep the data to review again later. Further explore what can be done with travel data? Could you view all your journeys in one place, and could you share it with someone? Extend the easy to access, consistent controls and state in other apps and services?